Clean from hard drugs for two years and living in the brand new Co:Here Housing Community, Todd K’s[i] journey of recovery has been long. In 2004 – the year he found out he was HIV positive – things started to change. Hungry, he walked through the doors of Jacob’s Well, a faith-based community in the Downtown Eastside, hoping for food. He got his meal; he also encountered a group of people committed to working and living in community with people in need. Todd’s new friends got him out of the Downtown Eastside and out to Surrey, where he became involved in a church, and again sought recovery. Todd has become heavily involved with the rhythms of communal life which have been established at Co:Here. One of the volunteer prayer coordinators mentions his name as one of the faithful attenders of the twice-a-week 6:30 am prayer meetings. He recently completed a 10-hour day at Co:Here’s commercial kitchen, preparing an Easter turkey dinner for the community. “I don’t even realize what I have yet,” he says. Todd was one of 34 residents to move this February into Co:Here, an innovative housing initiative stemming from Grandview Church — and built on the church’s former parking lot. It’s four stories high, with a purple and pale yellow colour scheme. Its angular, happily eccentric architectural style contrasts the stately (and famously pricey) Victorian houses lining East Vancouver streets. Co:Here is one church’s response to the “Vancouver housing crisis” – the term used to describe the rapid increase of both housing prices and homelessness in the last 15 years. Their vision is to produce an “affordable, holistic housing community . . . that will foster human flourishing.” The means by which they intend to do this is by having people of all ages and ethnic backgrounds, across all socio-economic boundaries, living side-by-side, as equals within a community. Specific factors that are considered include “income, financial obligations, previous rent, [and] size of unit.” Most residents pay 24–28 percent of their income. Some, says Jeanette, choose to pay extra, contributing into the Salsbury Rent Subsidy pool, which offsets others’ rent. Additional money to offset those not paying market rent has been raised from a variety of sources, both public and private. An early challenge was the process of choosing successful applicants. Co:Here planners wanted members who were already actively invested in Co:Here’s vision for community; yet, they also wanted to provide housing for people with pressing housing needs, who may or may not explicitly adopt the deeper vision of Co:Here at the outset. These two goals don’t divide neatly into two types of people. While recognizing this reality, the planners categorized successful applicants as “residents” and “co-residents” as a preliminary tool, with a certain number of slots allotted to each category. As distinct from residents, co-residents were those who actively articulated an intention to live into and contribute to a community of grace and belonging. They were those who would invest energy in coming alongside other members of the community, with hopes that all would soon catch the spirit. Shandelle Billows, co-director of operations, is quick to clarify that this initial division was intended to fade into the background as soon as possible: it was “a necessity in how we selected people to move in,” but is no longer a relevant distinction. In fact, to mention anything implying separation between different residents to someone involved in the project is to be gently but firmly re-directed. Their emphasis is placed firmly on the essential, spiritual unity and equality of the members – and it is in this emphasis that the truly unique elements of Co:Here emerge. The finished Co:Here Community Housing building at 1st and Victoria in East Vancouver. It is not the mere levelling of income disparity that makes Co:Here’s vision unique. Other housing initiatives achieve that same goal. Co:Here’s vision is more radical, even experimental. They want to break through the spiritual walls that divide classes. How do they propose this break-through be accomplished? By having people of every socio-economic status not merely co-existing in each others’ vicinity, but sharing the day-to-day patterns of life together – cooking, celebration, house-policy decision-making, Easter dinner, prayer. One of the Co:Here buzz-phrases is “mutual transformation.” The phrase expresses the desire that Co:Here transcend mere charity; it expresses the vision that every resident would experience real, face-to-face relationships with those they never thought they’d be close to, and in that, be transformed. 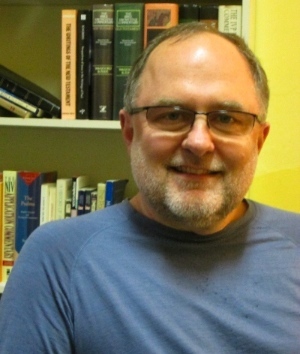 Tim Dickau — who became pastor of Grandview Church 29 years ago after attaining his MDiv from Regent College – explains that from the beginning of the project, Grandview’s model was “integrated housing.” This is different from housing models in which people of different socio-economic statuses live in the same complex, but are separated onto different floors or areas. In Co:Here, every type of person is integrated into the same floors and spaces. “There’s opportunity for transformation for everyone in that kind of setting,” explains Dickau. She further explains that with the integrated model comes a whole different emphasis in how to provide healing. Co:Here’s vision for helping those in need has less to do with internal professional support and more to do with the healing power of loving community. Jesus’ call is even more radical when you consider that he made a practice not just of sharing an evening together with folks who were often outsiders but of sharing his very life with them. “When we take up that practice, a funny thing starts to happen. We no longer are seen for how much money or education or status we have or don’t have. Instead, we are recognized by our names. We become known for who we are, with all of our gifts and flaws. Co:Here’s founders have expressed their commitment to “integrated housing” not just in the room layout, or in the theological vision, but also architecturally. Walking in the front door of Co:Here, you will find yourself peering lengthwise down a dining room that extends the length of the building, your vision only interrupted by six or seven hardwood tables and some brightly coloured kids’ toys on the floor. At one end of the room, there are sofas assembled around an electric fireplace. Abutting the dining hall are a number of rooms for communal use, including a library, an amenity room, a prayer room and – the ground floor’s pride and glory – a full-size commercial kitchen. Outside the dining room there is a large courtyard with extensive community garden space. One thing you won’t find on the ground floor: apartments. The hope is that with slightly smaller suites, and an enormous amount of space to play and garden and cook, residents will prefer spending time outside their suites, and facilitate their own community events. While one can learn a lot about community housing from looking at Co:Here as it now stands, ask any Grandview Church member and they will tell you that Co:Here can only be truly understood as the latest chapter in a long story the church has been telling for decades. The story didn’t arise overnight. It didn’t even happen over a decade. When Dickau tells the story of Co:Here, he begins back in 1996, when the church made an attempt (which ultimately failed) at purchasing a former seniors’ home for the purposes of transforming it into a community house. He admits, though, that his selection of 1996 as the starting date is somewhat arbitrary. Ten years, 15 years, 22 years – the point is simply to say that Grandview Church has been pursuing authentic, boundary-breaking community life for a very long time. There are too many stepping stones on the path to Co:Here to cover them all. Before Co:Here was even on the horizon, Grandview had converted their parking lot into a community garden, designed to bring people of the neighbourhood into shared, constructive space. In 1998, they started the Salsbury Community Society (which in turn initiated the Co:Here Housing Project) with the aim of owning a number of houses in the neighbourhood, where members of the church could live in community. Besides the official organizations stemming from the church, the church also has a strong general emphasis on physical presence in the community. Many congregants have moved to Grandview-Woodland specifically for the purpose of participating more fully in the church’s vision. Of course, while having dozens of church members living in the community, fully behind the church’s vision is helpful, that alone won’t win city council. When it came time for the climactic 2012 city hall meeting, the church was still much in need of the community’s support (not to mention that of the city councillors). The specific question at the meeting was whether or not the lot could be rezoned to be eligible for community housing. The larger question was whether the Grandview-Woodland neighbourhood was as enthused about the project as Grandview Church. This was a question with a theological dimension pertaining to the relationship between the church and the world: How would a secular neighbourhood react when a church decided to express their theological vision not merely from the pulpit, but with a very colourful four-story housing complex? The city council meeting online is remarkable – and still available online. The proceedings make for oddly compelling television. As the meeting opens, Mayor Gregor Robertson announces there are three items on the agenda: the first one has zero speakers from the community; the second one has four; and the third has 41. The third is the Co:Here rezoning hearing. Of the 41, about half are church members, and half are other community members. The church members, of course, speak passionately in favour. Of the speakers who aren’t church members, about half are in favour, half opposed. Many of those opposed are in favour of the building as a whole, but strongly opposed to the size and appearance of the building. There is a general confusion in the community as to why Co:Here needs so much real estate for garden and kitchen space. But despite the pockets of opposition, the overall tone of the meeting is something rare – an exuberant community-wide embrace of a public initiative, coming from a church. The most dramatic of the non-Grandview “yes” votes comes from Anna Baignoche, who leads a community choir called the Local Vocals. She calls up the entire choir to the stand, who, to the shock of city hall, sing rather than speak their approval. Half way through the song, a few restrained smiles can be spotted. At the end, sleepy Vancouver city hall is jarred by loud applause and whoops and hollers. After the choir steps off the stage, Councillor Tim Stevenson calls Baignoche back to the podium: “Would that be a yes?” he asks. “That would be a yes!” she responds, giving a thumbs up. The city-hall-as-church-service theme is taken even further at the close of the meeting. During the vote – which is decided unanimously in favour of Co:Here – it is as if the theological excitement of the church members becomes contagious. The final two councillors unexpectedly enter the territory of ecclesiology and theology, respectively, in their comments. I kept thinking while we were going through the entire process that what we are looking at is a minor miracle . . . It is a rare and unusual thing to have every person come in speak to a need for social housing in their community and welcome it. I wish the applicant all the best in their miracle. Does your church have a parking lot? Pastor Dickau certainly doesn’t discount the miraculous in Co:Here’s long growing process. But he also believes this type of housing initiative is more and more achievable – and more needed – for other churches in the city. His hope is that Co:Here will serve as a paradigm for similar projects emerging from church communities. Underground parking used to be really prohibitive to the cost of the project. But now . . . underground parking is a much smaller part of the total cost, and so it’s much more viable to take an existing parking lot and build social housing overtop and to retain underground parking for the church. Dickau is eager to convey the message of Co:Here, because he knows from personal experience that there is a lot of pressure on churches to use their land in ways with less capacity to impact neighbourhoods with the gospel. There is a lot of underutilized land in church parking lots. It feels like there is a lot of opportunity, but also a lot of urgency, because churches are going to get continued private pressure to sell their land or to develop it. They’ll receive a nice new building but they’ll lose the social value of the rest of that property. It’s an opportunity for the church to recover its sense of parish. There are countless questions still to be asked of the Co:Here experiment. And in some ways the hardest work – the work of actually living together – is just beginning. “I had my daughter visiting from Hawaii.” His voice breaks with emotion. “O my God. Sorry, I’ve been upstairs crying. I didn’t have much of a father in my life and visited much of the same sins on her that. . . .” He trails off, and then continues, “but I’m starting to make repairs and she’s been very gracious about it. To be in a place in my life now where I can contribute to her visit and give her spending money when she’s here and bring her to such a lovely home. . . .
[i] Todd requested only his last initial be given and is referred to throughout by his first name. Derek Witten is senior writer and editor at Regent College and managing editor of the Regent World, where this article first appeared. It is re-posted by permission.